Following on from the success of the limited-edition Speedmaster The Legend watch produced last year to celebrate Michael Schumacher’s record-breaking sixth world championship title, Omega now presents a new Schumacher The Legend collection comprising three Speedmaster chronographs with a sporty design in recognition of Schumacher’s outstanding 2004 season and yet another world championship title. Since first becoming an Omega ambassador in 1995, Michael Schumacher has added five consecutive Formula 1 world championship drivers’ titles to the two that he already had. Omega’s designers produced special limited-edition Speedmaster chronographs in celebration of each of these titles, with their own distinctive sporty design. Now, with no records left to break and an inconceivable eighth world championship title on the horizon, Schumi’s watch brand of choice also seeks to surpass its own previous levels of achievement with the launch of not just one special watch, but a whole collection. The Legend Collection consists of three Speedmaster chronographs that combine Omega’s high-end column-wheel chronograph movement with sporty Formula 1-inspired dials. Each model has a 42mm diameter stainless-steel case with the familiar curved Speedmaster stainless-steel bracelet and safety clasp. Sealed between the scratch-resistant anti-reflective sapphire crystal and the screw-in case back is the exclusive Omega calibre 3301 self-winding chronograph movement. A fine example of a superior chronograph, this movement has a vertical coupling that ensures instantaneous actuation of the chronograph hand when the pusher is pressed, a column-wheel mechanism for precision starting, stopping and resetting of the chronograph functions, as well as the Omega free sprung-balance for excellent stability of the watch’s going rate. Furthermore, the movement is an officially certified COSC chronometer and has a power reserve of 55 hours. The three models are distinguished by their highly individual dials, all of which have an applied Omega symbol at 12 o’clock and 12 applied rhodium-plated applied hour markers with luminous dots : the first model has a black dial with silver subdials and a silver exterior hour circle with black minute scale and red Speedmaster name; the second a silver dial with two-tone silver subdials with black outer zones and a black exterior hour circle with white minute scale and red Speedmaster name; the last model has a red dial with black subdials, black hour circle and white minute scale and black Speedmaster name. The former model has a tachymeter scale engraved on a black aluminium ring on the stainless-steel bezel, whereas the latter two have it engraved in black directly on the brushed stainless-steel bezel. All three models have a white-on-black date window at 6 o’clock and baton hour and minute hands with an arrowhead central chronograph seconds hand – all with luminous SuperLuminova inserts. 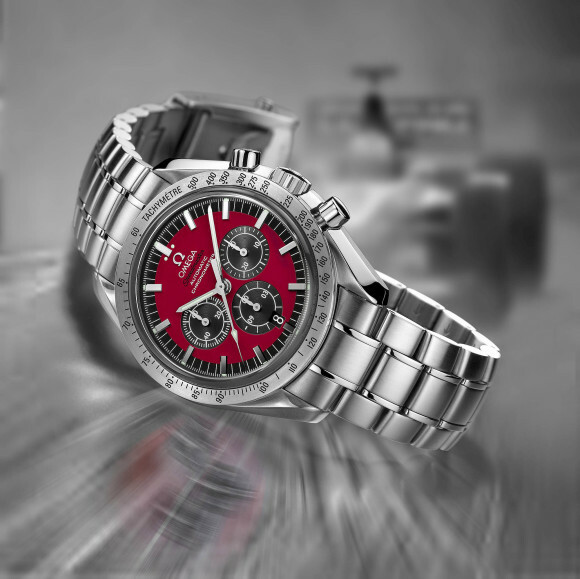 Not only do fans of Michael Schumacher, Formula 1 or the legendary Omega Speedmaster now have a choice of three models in the same season, they no longer need to cross their fingers in anticipation of securing a much sought-after limited-edition watch either, since these models are all part of the standard international Omega collection. 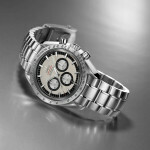 This entry was posted in Press Release, Speedmaster Automatic and tagged 3506.61.00, Schumacher on March 30, 2005 by Dale Vito.